Online Social Networks are a recent global phenomenon of the last five years. This article will consider and assess the appearance, value and under-realised potential of social networks that connect cultural practitioners and organisations who are responding to ecological concerns across the world. Many of these practitioners and organisations are increasingly aware of the grave consequences to the biosphere caused by the globalization of the west’s unsustainable high carbon lifestyles and industries that arose during the last century and the urgency of the need to respond to these concerns. At an international meeting of art councils and other key national art organisations and cultural practitioners at the Copenhagen 2009 Climate Change summit it was recognised that humanity has four decades or less to change its behaviour to live more sustainably on the earth, and most importantly culture will have a significant role in helping change people’s behaviour and envisioning new ways of relating to the natural world (CultureFutures, 2009). A draft background and policy document prepared by Culture|Futures argued that ideas and practices of sustainability must be introduced throughout all cultural sectors, from how we educate those sectors to enabling sustainable policy changes across cultural organisations and institutes. Much focus was given on how the arts and its practitioners may respond to and envision new sustainable futures within this relatively short time frame and networking was raised as an important issue with an online social network setup during the conference http://culturefutures.ning.com/. The conference also identified that artistic activity and the few recent art and ecology programmes and organisations endeavouring to highlight these concerns and offer new visions, are dispersed, uneven and continue to operate only on the very margins of contemporary cultural discourse and cultural development. It is particularly noteworthy that other leading international organisations are similarly corroborating the importance of culture’s important role in introducing sustainability across the world: the British Council produced a framework document on Culture and Climate Change in early 2010 and in recent months UNESCO published a key series of documents on role of culture for global sustainability and development (UNESCO, 2010). However, that such an important role has been identified for culture sits with the growing realisation that contemporary culture has in the main left the understanding of the natural world and its resources to the sciences. This explains why it has been increasingly concerned science and environmental organisations that have initiated many of the leading climate change cultural activities to date. In this part of the world, Oxford scientists, such as Prof. Diana Liverman, led some of the first open discussions about climate change with cultural practitioners in 2005 (Oxford University Centre for the Environment, 2011). The lack of awareness in cultural circles to recognise the magnitude of impending ecological and resource-limit eventualities is extremely worrying, however it is also historically complex and is beyond the scope of this article to explore. It is also not helped that the media’s climate coverage internationally has sunk to its lowest level in 5 years preceding 2010 (Merchant, 2011). Added to this is that research psychologists interested in how science can be effectively communicated have observed that climate change is a ‘diabolical’ problem; it is invisible, it has taken a century to register the problem and the effectiveness of actions to address the problem will probably never be able to assessed to see if they have worked (Newell and Pitman, 2010). This article instead focusses on how online social networks have had a part to play in the last few years in making art and ecology activities more visible although it argues that their use has not been strategically utilised or examined in detail. Brief definitions of social networks and network theory are also examined for this context. The current status of new online art and ecology networks (for the purposes of this essay ‘art and ecology networks’ is a general term to cover the variety of cultural practices and initiatives that reference concerns for the natural world and its resources), with all their variety, reveals that generally, while online, ‘niche’, social networks are easy to create there is evidence to suggest that there has an absence of aims and strategies to sustain such networks in the longterm. Ironically, sustainability and the work to nourish these valuable networks has not been considered as in the case of the Culture|Futures network site itself or in the recently ended UK RSA Art & Ecology network. However some efforts are being made to remedy this, as there is growing recognition, particularly in the social sciences, of the valuable knowledge and experiential value embedded in such networks. That online network technologies are evolving and influencing cultural production and distribution for cultural practitioners working with these concerns is evident, yet such changes are beyond the scope of this article to detail. Briefly, cultural theorists such as Nicolas Bourriaud, have observed that ‘artists no longer prioritise ‘originality’ but intuitively recognise that their artworks exist within networks, and that the meaning of such works depend on their relation to others and their use’ (Bourriaud, cited in Network Publics 2008, p. 150). The future of these online networks also rests with the exponential, yet hard-to-predict rapid developments in social media technologies amidst very changed economic realities. New social network technologies appear to provide an important means to make visible and increase the level of discourse surrounding valuable new art and ecology practices and in particular to those who are or are beginning to engage in ideas about climate change and natural resource limitations. In recent meetings held during 2009, a 16-member quorum of scientists, scholars and professionals representing several universities in the United States proposed a ‘Four Culture Synergy for engaging society on climate change’ (Nesbit et al., 2010). In their proposal there are strong and developing arguments to suggest a critical role for social media to rapidly connect cultural strategies with three other disciplines, environmental sciences, philosophy and religion, and the social sciences, to more effectively engage the public in climate change. These researchers acknowledge strategies, resources and funding must be allocated for such initiatives to succeed. of the arts in both increasing engagement and even mobilising participatory localised responses in general audiences across the world to climate change. 350.org in particular has exploited social media networks and visual online tools such as Flickr and YouTube to visually connect local public responses to climate change from all over the world. For e.g their Global day of actions and candle vigils in 2009 coinciding with the Copenhagen summit (the author was involved in one of the 350.org candlelit vigils on Mt Leinster, Ireland); their ‘Global Work Party’ of 10.10.10 which led 7,000 events in 188 countries; their recent artist led, gigantic images that could be seen from space, from 16 places around the world, and which involved thousands of participants in the lead up to UN climate talks in Cancun in Nov 2010 (http://www.youtube.com/watch?v=0-HnrMrQ6Tw ). The 350.org organisation has been recognised for its creative implementation of social media, with the website Critical Mass declaring in 2009 that 350.org was one of the strongest examples of social media optimisations the world has ever seen (Grimmier, 2009). At the conclusion of their new book Mobile Lives (2010), sociology theorists, Elliot and Urry, also identify the striking success and spread of the climate change / peak resources Transition Town movement globally. It is an organisation that has readily used the low cost, niche social network platform Ning.com to great effect across a growing number of countries. As a side note, it is interesting that art played a part in both organisations as both have been led by cultural practitioners; Bill McKibben of 350.org is a celebrated writer and environmental communicator, Rob Hopkins was formerly a visual artist. While organised networks have existed for centuries, the scale and speed of large sectors of society across the planet participating in online social networks is a phenomena that is rapidly and radically changing many facets of contemporary life. In little ‘more than a decade, network culture’, superseding postmodernism, has become the ‘dominant cultural logic’ (Varnelis, 2008, p.145). The social network phenomenon rests on the largely unexpected coming together of widely available, participatory web 2.0 network communication software technologies that meshed with humanity’s greatest need, the need to connect (Li and Bernoff, 2008, p.x). This development is very recent if we consider that the world’s most popular social networking site, Facebook, was invented in 2004. Online social media play into other sociable needs and are further characterised by these attributes: participation, openness, conversation, community and connectedness (Mayfield, 2008, p.36) and importantly its structure results in a flattening of hierarchy. ‘individuals to (1) construct a public or semi-public profile in a bound system, (2) articulate a list of other users with whom they share a connection, and (3) view and transverse their list of connections and those made by others within the system’. Art and Ecology social networks would be classified as ‘niche’ networks with their focus on one topic although networks may exist to serve many criteria. Social network sites commonly have features that allow messaging to other users and across the network, the ability for users to upload and share text, their blog content (RSS feeds) and images and form subgroups on special skills and or interests within the network. That social networks have been found to reinforce relationships between family and friends explains the enthusiasm and quick adoption of social networks into the fabric of everyday life. Although Internet activity across the world is uneven and differs across age groups and to some extent gender, across the world there is a predominantly positive view of social media. However, the vast numbers who use networks such as Facebook, Twitter, and others employing similar simple technologies to build their own networks would perhaps be more unfamiliar with criticisms that social network phenomena rest with the widespread and uncritical acceptance of the liberatory ‘Californian Ideology’ where many of these technologies evolved. From this background comes the idea that the online network ‘is both a space for self-realisation and a natural road to a greater democratic governance (Varnelis, 2008, p.159). For good measure, and particularly those involved in culture, the views of entrepreneur and author Andrew Keen are similarly noteworthy. Like Varnelis’ who questions ‘whether we, the inhabitants of our networked publics, can reach across our micro-clustered worlds to coalesce into a force capable of understanding the condition we are in…. or are we doomed to dissipate into the network?’, Keen has strongly argued about the dangers of ‘digital narcissism’. In his polemical book The Cult of the Amateur: How the Democratization of the Digital World is Assaulting Our Economy, Our Culture, and Our Values (2007), Keen argues strongly that new social media ‘worships the creative amateur: the self-taught filmmaker, the dorm-room musician, the unpublished writer’ and undermines the authority of experts in every field (Keen, 2006, p.1). While cultural production being profoundly and perhaps negatively affected by Web 2.0 technologies, identifying the power of networks to transmit information and change behaviour is particularly relevant for cultural practitioners interested in engaging in and instilling new sustainable behaviours in their audiences and cultural spheres. Recent research from social scientists and now best-selling authors of the book Connected: The Surprising Power of Our Social Networks and How They Shape Our Lives (2009), Nicholas Christakis and James Fowler have some new interesting facts about how online social networks are currently working. Their research shows that online social networks relay information but rarely change behaviour; instead their power lies in the ‘nature and quality’ of connections and that participants in any given network will have ‘weak’ and ‘strong’ connections to others. Interestingly for the Facebook readers among us who notice those with large numbers of ‘Friends’, it is the strong connections people have online, rather than the numbers of connections, that can be utilised to powerfully ripple out and influence the multitudes. However for people to transmit concerns/issues through networks the authors stress that there has to something important at stake for people to identify with. In a recent article the authors assert that ‘strong’ connections in networks can be cultivated and that networks can be strengthened immeasurably when ‘online interactions are, or feel, real’ (Christakis and Fowler, 2010). They mention the success of the Obama election as an example but 350.org and transitiontowns, in the context of this discussion, have also employed these strategies to great effect. ‘…it’s because I do a lot of my work on how climate change will affect the developing world and the poor and the sort of groups that OXFAM is concerned about. I just thought, is anything going on there in terms of connecting art and culture in terms of those millions of people who are going to be affected by climate change?’ (Liverman, 2010). It would seem that 350.org has made a start to address the use of art to connect to and highlight the voices of other nations. Yet, in the future, proposals such as the previously discussed Four Synergy model, that aspire to effectively connect the arts to different disciplines to more rapidly effect societal behavioural, must consider culture’s role more strategically with the advances in these network technologies. The author notes with interest the setting up of the new International Climate Justice foundation, The Mary Robinson Climate Justice Foundation, in Ireland in late 2010 spearheaded by former Irish President, Mary Robinson www.mrfcj.com This foundation has brought together many key thinkers in human rights, international development, politics, population studies, business strategy and climate science but absent so far are leading cultural thinkers and practitioners. Reflecting on the success and knowledge gained of previous global cultural projects such as LiveAid and Live8 to highlight global injustice, which in turn informed newer successful global poverty awareness raising organisations like ComicRelief and U2 Bono’s One, it seems likely that adoption of similar cultural strategies would be very engaging and effective in communicating ideas and responses about global climate justice. ‘Communication about climate change will most effectively move people to action when it is framed not as a matter of science… Allies in communicating about climate change will be found among society’s storytellers, including novelists, poets, and other creative writers; journalists; musicians; documentary filmmakers; film and television producers; visual artists; and practitioners of the burgeoning variety of online social media…they can provide the context for values-based discussions of how we ought to act in the face of the challenges presented by climate change and, increasingly through digital media and innovative deliberative forums, the resources and opportunities for direct participation by the public’ (Nisbet et al., 2010). Also noteworthy is how various sectors in society have exploited social network technology differently. Some sectors, such as business, have been quick to enthusiastically endorse the global potential of online mass communication and collaboration tools no longer hindered by geographical concerns. Business strategists and innovators of intellectual property, Tapscott and Williams, in their best-selling book ‘Wikinomics’ (2006) outlined many key benefits of online collaboration for research and business although they have understandably readjusted their utopian business expectations against the realities of the current economic downturn post 2008. Author, economist and international policy advisor on long term sustainability for cities and regions, Jeremy Rifkin, suggests in his recent book The Empathic Civilization: the race to global consciousness in a world in crisis (2010) that this paradigm shift in communication technologies, coincides with timely new scientific understanding on how much of the biosphere is biologically ‘soft-wired’ for empathy. He believes that such radical developments coming together may signal the birth of global empathic civilization that will respond, but he fears perhaps not in time, to the world’s most pressing planetary concerns, including climate change (Rifkin, 2010). From another perspective, previously mentioned sociologists, Elliot and Urry (2010) make a considered case for how developments in network technologies may be used for good or ill in four possible near-future post-carbon societies: ‘perpetual motion’, ‘local sustainability’, ‘regional warlordism’ and ‘digital networks’. That social media networks and technologies as yet unknown will have a significant role to play in the world’s response to climate change / peak oil scenarios cannot be doubted. In all these discussions of online networks in the context of spreading ideas of sustainability to and by cultural practitioners, the sustainability of the Internet must also be noted. With 1.5 billion users online and exponential Internet use in Asian continents predicted, scientists are estimating the energy cost of Internet servers is increasing by an unsustainable 10% each year (Johnson, 2009). In addition, some risk/resilience analysts, describing the possible future economic instability accruing from peak oil/climate change scenarios, often depict the fragility of Internet network infrastructure (Korowicz, 2010). In conclusion, an awareness of the conflicting debates, inequalities and as yet under-explored creative potential of web 2.0 technologies and its limitations will be critical in establishing viable, valuable and accessible networks for this context. For cultural practitioners and organisations engaged in ecological concerns, whose cultural activity as previously stated, has been on the margins of cultural discourse and education over the last 30 years, online social networks have offered a relatively simple, low cost and significant new means to aggregate information, profile art works and projects, and connect individuals and groups working on common ecological/environmental themes or concerns. The following is a description of the variety of social media platforms and how they are currently being used by art and ecology organisations and cultural practitioners. Many art and ecology organisations/practitioners have created dedicated Facebook ‘Pages’ to distribute information to interested followers and these have links back to their static websites, for e.g Cape Farewell (organisation, UK; 800+ followers), the Sitka Centre for Art & Ecology (organisation/residency centre, USA, 560 followers), ecoartspace (organisation, USA; 4,176 followers); RSA Art & Ecology (UK: live but inactive due to programme ending in 2009; 513 followers) ecoartworks (US artist; 164 followers), ecoartnotes (Irish artist; 270+ followers) etc. These Facebook ‘Pages’ supply a constant trickle of information to profile their activities and related activities that they or their followers may post. However Facebook ‘Pages’ rarely involve in any indepth discussions. Their most powerful features are to maintain the profile and ideas of the group, individual(s) or organisation and enabling the posting of notices/events to all followers. In return ‘followers’ of Facebook ‘Pages’ benefit, if they are aware, of being able to post short notices of their news or activities. Facebook ‘posts’ may also provide content for other social profiling media such as Twitter, to build audiences and quickly exchange information. In the last couple of years, more fully participatory online social network platforms have appeared that created the potential for greater, in-depth, peer-to-peer network experiences. 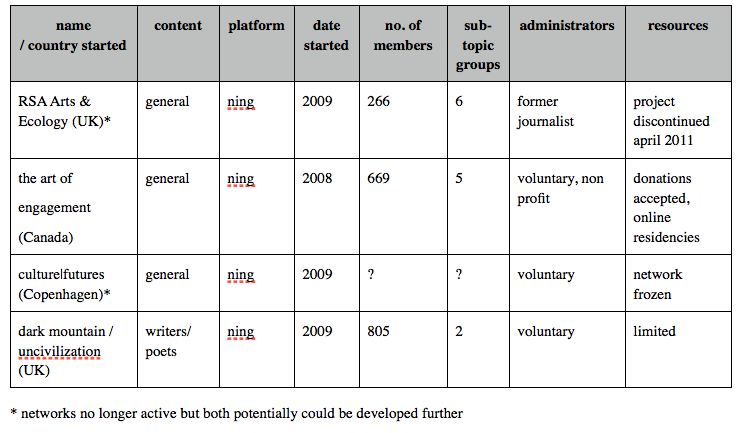 Rather than broadcast topdown communications from an organisation through static a website, and/or from an organisation’s Facebook ‘Page’, customisable, ready-made network platforms, such at the popular and low cost Ning.com platform, have been quickly adopted by some art and ecology organisations and groups. These network platforms can be used to easily invite other cultural practitioners to feature their work and knowledge and allow them to connect and network with others. Ning’s easy setup (Ning advertises that with average internet skills you can setup a network in 60 seconds) mimics the ease of use and familiarity associated with Facebook, but in addition allows members to upload ‘rich media’ content of their work and knowledge, enter discussion forums, form subgroups and post event notices across the entire network. Alternatively, custom-made network sites and those using alternative but increasingly popular, open source, self-hosted network platforms, for e.g Drupal, Joomla, etc could also be used. However the ‘ready-made’ simplicity (web developers are not required) and low setup cost of Ning networks means for the present that Ning sites have appealed so far to most low resourced art and ecology groups and organisations. Something to note however, is that members’ data on Ning sites are kept on Ning servers, a position that many are cautious about, given the unpredictable rise and fall of social network media platforms. It is a reason that some have and will seek Drupal and other self-hosted social media network options to safeguard their members’ data. An interesting example of a custom built network site is the partnered initiative of the European Cultural Foundation, labforculture.org (a website that is connecting 50 countries in 6 languages). A well resourced online project, it has a subsection for ‘culture and climate change’, where cultural practitioners can join and profile their own activities whilst accessing online video interview and articles with key thinkers and curators working in this context. This site makes full use of new networking functionality though it is limited in other areas; besides identifying others working in the same field, users can tailor ‘subscriptions’ to automatically receive updates on their selected topic areas, upcoming events, projects. As a large portal site, there is also information on Europe funding and resources for research. Users can also ‘bookmark’ content from the site to build their own ‘knowledge’ bank. In contrast with the Ning sites, the labforculture.org site is considerably more formal. While the professional layout does engender a seriousness to cultural activity in this field, the informality of Ning-type networking facilities would appear to encourage more communication between it’s members (note, recent communication with the administrators for labforculture.org indicate they are redeveloping the site in the near future to provide even greater functionality so it would appear to be an important developing network). Below are a few examples of current online art and ecology networks of note (Table 1). Others exist in other parts of the worlds with different languages and not listed are a number of key art and ecology groups and institutions that have as yet not adopted networks1. Of the networks examined most have been established very recently and in fact two of these networks are presently inactive*; unforeseen reductions in arts funding along with a general decline in media coverage of climate change in the last few years, as previously discussed, has unfortunately had negative consequences for these new initiatives. Some online networks have evolved from static resource websites to which they are linked, for instance the UK RSA Art and Ecology network and the larger Canadian nonprofit Art of Engagement network. Other networks evolve from specific projects and some are stand alone entities. Networks cover either one discipline or encompass the arts in general or a specific theme or topic. The easy ability to upload photographs and videos to Ning style networks has readily attracted the registration of many visual and performance artists. Some art and ecology organisations who have been established for many years, such as the UK Landscape and Arts Network (1993) and the US Greenmuseum.org (2001) have significant directories of artists and projects listed on static websites, yet have been slower to exploit online social networks. This is probably because in many cases they have grown as nonprofit organisations with very limited financial support. There have been some immediate benefits that online social media have brought to the area of art and ecology. They have considerably added a new dimension to the very limited number of text publications that have been produced over the last decades on art and ecology themes. Online art and ecology networks and blogs have given practitioners, albeit those with network capital, the means to self-publish their activities instantaneously. Suddenly these networks have made visible large numbers of practitioners, projects and programmes engaging with these concerns. Many working in this area have found that perhaps for the first time they are not so isolated and have been easily able to access, connect and engage with others’ practices. Furthermore, the grassroots, informal and non-hierarchical nature of social networks appear to have been popular as many of these practitioners would not subscribe to the dominant themes of the art market or trends in contemporary curating. Access to more experienced practitioners has been greatly improved although as this technology is new, there are many practitioners who do not have the Internet skills to engage with these tools. Some organisations, groups and individuals, have used other social media such as blogs. to create more interactive information resource websites rather than use network sites, to inform others and reach new audiences. Increasingly though groups and organisations are recognising the popularity and power of network platforms using them in preference or in conjunction with blog sites. However while initial benefits from art and ecology social networks have been encouraging, with many cultural practitioners enthusiastically having added their profiles, links to their own websites etc, uploaded photos/videos/articles of their work, what has resulted in the main so far, is little more than interactive, informal online directories. Many cultural practitioners users seem unaware or lack the network skills to see the potential to transmit their ideas, knowledge and new practices across such networks to push forward developments in their disciplines. In some cases, after initial interest, activity in some networks has fallen away. This is not helped as most users have joined these networks based on their informal experience of other social networks sites, such as Facebook that encourage only shallow and short interactions. So it is perhaps not surprising that many have not considered that part of their practice may now encompass networking that may include forming their own special interest subgroup(s) (see the low level of subgroups formed by members in the networks (Table 1), leading or actively participating in discussions, sharing knowledge and experience or more widely distributing their work etc., through such networks. Network administrators are also just beginning to think of the creative possibilities that could achieved through networks: The Art of Engagement Network (islandsinstitute.ning.com) has begun an ‘online residency’ for its members for example and perhaps most exciting is to see network technologies being quickly used to support specific new collaborative projects across regions, for e.g rhyzom.net. The Dark Mountain Uncivilisation international network composed of former journalists, writers and poets have come together relatively quickly in 2009 to publish a popularly received manifesto and book (Dark Mountain, 2010) due to the activities supported by their online network http://uncivilisation.ning.com. The literary area is important as in-depth ecocritical theory has occurred for longer in that discipline than any other. Users of social networks, however, increasingly face an explosion of new social media developments and the unlimited interactions can easily overwhelm and distract, from the purpose of networking and working in general. It is worth keeping in mind that individuals do not have the ability to meaningfully connect to more than 100 others and as discussed previously networks value often lies in reinforcing existing connections and could also apply to cementing new offline connections, for e.g after when cultural practitioners meet at conferences and seminars. However there are interesting studies have shown that large numbers of loose connections to a variety of networks can be very valuable in bringing new ideas and opportunities to participants. Belonging to a number of different networks, for instance across disciplines or regions, is also to be encouraged as there is growing research that demonstrates that niche networks often homogenise and ‘reinforce opinions between likeminded individuals’; this has observed particularly within online political networks that further cement one set of views (Varnelis, 2008, p.157). There is also the still not completely understood phenomenon of collectives that reach a critical mass having a power for action above and beyond any the actions of any one individual; the sense of belonging and joining to support change is as attractive online to some, as it is offline. The recent success of numerous global online petitions to highlight and counter a range of issues, from suspect multinational corporation activities, to human rights abuse and environmental issues, are a case in point. Sustainability of online networks is obviously crucial for a network’s longterm development yet it appears to have been overlooked with the easy setup of recent online networks. The speed of social network technology merging with everyday life has meant that the strategies on how to best use maintain and develop networks are often coming after the adoption of the technologies. For some art and ecology networks the recognition of the work involved in maintaining, let alone thinking about strategic development for networks has been overlooked along with considering how the potential of networks could be directed. For instance, leading social media blogger and strategist for business, Seth Godin, has commented how social networks are a radical means to coordinate groups and ideas but ‘this is all worthless if you don’t decide to lead’ (Godin, 2008, p 4). Ideally, to create vibrant and influential art and ecology networks, an administrative team preferably composed of those who both understands the functionality and potential use of new social media tools and who can enthusiastically educate and relay their use to their members, and others who can recognise and drive key art and ecology debates, discussions, instigate projects etc., across the network and encourage members to interact to share ideas and practices for the development of the field. Recognition too that networks are collectives and resist former topdown hierarchy structures suggests the power in the network can lie in users of the the network to also generate new strategies, ideas and practices. Involving a former journalist to administrate the RSA art and ecology network and blog who could quickly review exhibitions, practices and highlight key debates and events to members, for instance, was very valuable, both for members of the RSA Art and Ecology network whilst also improving the credibility of new art and ecology practices to the media and audiences. In outlining the administrative and strategic roles behind a network one can see the maintenance and development of networks requires considerable work and time. Yet to gather the most value from networks requires that they be nurtured and nourished (Christakis and Fowler, 2009’; see also Christakis’ 2010 TED online presentation). Network social theorist Lovink has outlined if social networks are to fulfill their potential ‘they have to face economic realities, no matter how advanced their dialogues or networks maybe’ (Lovink, 2005, p. 24). To maximise this, adequate funding and longterm social media strategies will be required and if there are ambitions to connect key people from different disciplines, consideration should equally be paid to recruiting the knowledge of social media experts and strategists. Lovink also mentions that networks, as they scale up need to consider the accountability and transparency of their aims and objectives (Lovink, 2005, p.23) to their users. It is noteworthy that the US Centre for Sustainable Practice in the Arts experimented with a free Ning network but has since discontinued this model in preference to a paid membership fee for its online resources, workshop opportunities, e-newsletter service and blog, with some of the fee going towards supporting a limited number of members’ new art and ecology projects. Monetizing such networks, particularly as the majority of other networks are free, is presumably difficult as artists’ financial resources are often limited. The well regarded and long establish US Greenmuseum.org art and ecology directory, while not as yet having an online network, has in response to the reduction of available government arts funding and in growing national and international interest in their group adopted a ‘giftivism’ voluntary model to expand its operations, although details as yet are unclear how this would significantly reimburse those heavily involved in the project (Hobson, 2010). Another aspect of social networks used in the arts is that they easily allow creative practitioners, with social media skills, to self manage, ‘self-curate’ and distribute their work without the need for institutional frameworks. Social networks’ informal and unregulated framework blur boundaries between disciplines and often refreshingly present those with little cultural experience, those with marginal or out-of-step practices, directly alongside leading practitioners, curators and institutional figures. This presentation of very diverse practices is to be welcomed and as they collate information of ideas, experience and practice, and online networks would also appear to offer a considerable new educational role. However network culture theorists, such as Varnelis (2008), has pointed out that networks are too amorphous as social structures to be easily managed by institutions. Their non-hierarchical, peer-to-peer and informal framework are very much at odds with current educational and most cultural institutional structures. ‘Activities included pedagogical exchanges in existing courses through course modules that combined artistic and science/social science perspectives; the creation of new co-taught courses that engaged arts disciplines as elements of research and learning around climate change; a first year student common reading and Common Experience program; and two major festivals that included performances, visual art exhibitions and installations, and commissioning of student, faculty and visiting artists (Wesleyan University, 2010). Organisations that concentrate on policy development, such as the UK’s Julie’s Bicycle (www.juliesbicycle.com) are spearheading sustainability policies across the music, performance, festival and more recently the visual arts. They network with science advisors and highlight these initiatives with celebrity musicians, leading curators and arts directors. Their collaborative approach with key figures led to its involvement at the international Culture|Futures meeting and subsequently its policies, sustainable guides for music recording and venues, festivals, orchestras, theatre and the visual arts etc., are significant for culture generally and are beginning to be adopted in other countries, for e.g Australia. ‘I think it’s essential with the rapid expansion of the contemporary art world globally and with more and more people travelling from one art fair, biennial or exhibition to the next, that we examine our behaviors more rigorously. I attempt to do this on a small scale in my studio by doing practical things like painting the pitched roof above my skylights white, to reflect more natural daylight into my studio. On a larger and more philosophical scale I have been questioning the amount I travel internationally both in accompanying works and also in terms of committing to exhibitions abroad. I’m on various advisory boards and try to raise green issues. It is amazing to see the impact of one small suggestion to the right person at the right time.’ (Parker, 2010). Similarly there is much need to examine the travel costs with international conferences, cultural residencies etc., and to rethink how new social media could connect and exchange information between cultural practitioners, academics, curators, audiences etc. Simple and widely available tools such as audio-podcasting has a very valuable role in making available content to global audiences. RANE’s (UK Falmouth University’s Research in Art, Nature and Environment) growing online audio archive of visiting arts practitioners talks, the recent UK Open University Itunes podcast series of talks on Mediating Change: Culture and Climate Change (2010) and labforculture.org’s climate change video-cast interviews capture the value of key talks to those who can’t attend but also to those who will increasingly wish to limit their travel. Vast amounts of scientific evidence gathered over the last few decades indicate the serious effects the globalized industrial age has on our climate, our resources and the ecosystems that support life on earth. Almost total scientific consensus on climate change evidence reveals alarming biosphere instability. This is already affecting many hundreds of thousands of people annually, with the likelihood of unstoppable and devastating climate change scenarios a growing possibility. Yet much of contemporary society fails to connect scientific evidence with the urgent need to adopt sustainable practices across all sectors affecting everyday life. ‘I think that there’s a parallel in that whilst it’s good to have a diversity of responses the research that I’ve done looking at how everybody else’s responding to climate change cities, states, individuals, suggests that yes, you want a lot of different actions but actually networks make a massive difference. So I think my suggestion is however diverse the artistic response is the power of networks to link people together, to share best practice, to inspire each other and to influence policy and the public. So, I think that individuals linked into networks is what could make a difference (Liverman, 2010). However rapid adoption of new skills, thinking and strategies are required if vibrant and innovative networks that augment cultural practices and engage audiences are to be established and realised within the relatively short timeframe that scientists have outlined to avert the worst of climate change scenarios. In the near term, art and ecology networks might look to include implementing strategies from environmental and political activism, marketing and PR strategies from business, as well as connecting with social media experts and research from the social sciences to fully harness the potential of these radical new and change-making communication tools. Christakis, N. A and Fowler, J.H (2009) Connected: The Surprising Power of Our Social Networks and How They Shape Our Lives. US, HarperPress. Christakis, N. A and Fowler, J.H (2010) Do tweets change your behaviour? CNN International http://edition.cnn.com/2010/OPINION/11/16/fowler.christakis.tweeting/ accessed 6 Jan, 2011. Christakis, N. The hidden influence of social network http://www.youtube.com/watch?v=2U-tOghblfE&feature=player_embedded accessed 10.1.11. Elliot, A and Urry, J. (2010) Mobile Lives. London, Routledge. Fitzgerald, C. (2010) Culture and Climate Change – transforming the ‘way we live together’ to bring humanity to an ecology age within 40 years http://ecoartnotebook.com/?p=894, accessed 6 Jan. 2011. Godin, S. (2008) Tribes: We need You to Lead Us. London, Piatkus. Gremmier, M (2009) #350ppm: The Little Hashtag That Could. Critical Mass website http://experiencematters.criticalmass.com/2009/10/30/350ppm-the-little-hashtag-that-could/#more-963, accessed 3.1.11. Hobson, M. D. (2010) Greenmuseum.org, Giftivism and generosity; interview with Sam Bower and Anne Veh, Arts and Healing Podcast, http://artheals.libsyn.com/green-museum-giftivism-and-generosity-interview-with-sam-bower-and-anne-veh, accessed Jan 9, 2011. Li, C. and Bernoff, J. (2008) Groundswell: winning in a world transformed by social technologies. Boston, Harvard Business Press. Liverman, D (2010) A History of Cultural Responses to Climate Change, Mediating Change: Culture and Climate Change Podcast Series and transcripts, Open University, ITunes U. accessed 8 Jan2011. Lovink, G. (2005) The Principle of Notworking: concepts in critical internet culture. HvA Publicaties. Keen, A. (2007). The Cult of the Amateur: How the Democratization of the Digital World is Assaulting Our Economy, Our Culture, and Our Values. Doubleday Currency. Korowicz, D. (2010) ‘Energy Constraints will Collapse Economic Recovery: dependency on declining oil reserves may lead to mass unemployment, government defaults, infrastructural breakdown and even famine.’ The Village, Dublin, pp. 60-62. Newell B.R and Pitman, A. J (2010) The Psychology of Global Warming: improving the fit between the science and the message, American Meteorological Society. Aug, pp. 1003-1014. Nisbet, M. C., Hixon, M. A., Dean Moore, K., and Nelson, M. (2010) ‘Four cultures: new synergies for engaging society on climate change’, Frontiers in Ecology and the Environment, 8: pp. 329–331. Mayfield, A. (ed.) (2008) What is social media, Networks, V1.4, p.36. Available at: http://www.icrossing.co.uk/fileadmin/uploads/eBooks/What_is_Social_Media_iCrossing_ebook.pdf. accessed 28 12 10. Parker, C (2010) Green Visual Arts Guide http://www.juliesbicycle.com/about-jb/news/968,Green+Visual+Arts+Guide+launched+at+Frieze+Art+Fair.html , accessed 23.1.11. Tapscott, D. and Williams, A. D. (2006) Wikinomics: how mass collaboration changes everything. London, Atlantic Books. Varnelis, K. (ed.) (2008) Network Publics, London, MIT Press. Wesleyan University (2010) Feet to the Fire: Exploring Global Climate Change from Science to Art. Project details on http://www.creativecampus.org/projects/wesleyan-university-feet-to-the-fire-exploring-global-climate-change-from-science-to-art, accessed Jan 19, 2010.